Originally the English Pointer developed in Spain. The British soldiers, who were stationed there during the War of the Spanish Succession and during the following decades, brought it from the Iberian Peninsula to Great Britain. Since the 17th century, the pointer in Great Britain has been used for hunting. It received its name not for hunting game but because of its untypical dog behavior i.e. its “motionless poise” with a raised front paw to point (pointing dog). Thus, the task of the pointers was met; in the fields he showed the hunters where the game is to be found, so that these could bring in the faster greyhounds to catch the spotted prey. The pure-bred English Pointer is very symmetrically built and grows up to 69 cm high and weighs 30 kg. His coat is firm and fine thereby completely smooth and glossy. The coat is usually white and lemon-yellow, orange and white, liver-brown and white, as well as black and white, but also single-color and tri-color breeds are possible. The pointer was selected solely on performance and character not on appearance; however, the result was a well proportioned, cutely marked dog breed of great endurance and robustness. The most significant expert of pointers in England was at his time W.W. Arkwhigt, who wrote the standard work about the breed. It was translated into French. Unfortunately there was never a German edition. The first pointers came to Germany about the beginning of the second half of the last century. The breed is so far only slightly common in Germany. 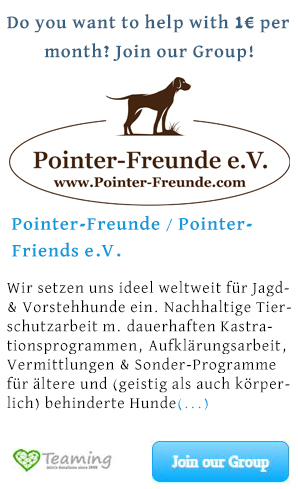 Here, the English Pointer was used for improving local pointers. The German Shorthair has its origin between the 15th and 17th centuries from the German breed Bracke (hound) and was developed by cross-breeding the Spanish Bracke (hound), Bloodhound, later on by the (English) Pointer and English Foxhound. Pointers were used for bird hunting in the entire Mediterranean region. The all-rounder spread over time also into German princely courts. After the invention of the flint-gun the need arose for dogs that could not only point to the birds, but also to retrieve them. 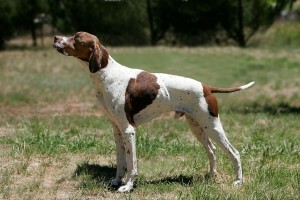 By cross-breeding with English Pointers, the agile German Shorthair was the result. Since the publication of the pedigree-book by Prince Albrecht zu Solms-Braunfeld in 1897 the German Shorthair was used successfully worldwide as a hunting dog. It reaches a height of 58-66 cm and has a weight of 25-32 kg. Its hair is short and dense; it’s supposed to feel rough and hard in many variations of brown, brown roan, black roan, black, white, each with patches, specks. The short coat of the dogs is relatively easy to take care of. The ears are moderately long, set high and wide, smooth and without turning hanging down close to the head, rounded from below. As a pointing and hunting dog the German Shorthair is suitable for hunting because it has an excellent sense of smell and retrieves well, easy to train and is an affectionate companion dog. He adapts well to life in the family and when properly handled is friendly to children, however, it needs plenty of exercise and appropriate tasks, because it is a hunting dog with lots of energy. Suitable occupations are all forms of nose work, such as tracking work (Man trailing) and retrieving training. Since the 1950s, it is used as a sled dog in Northern Europe. Through further breeding attempts with the dog, further breeds developed such as, for example, the German Wirehaired Pointer. At first, the German Wirehaired Pointer was very small and only over the years with successful breeding with other races the German Wirehaired Pointer became such a proud and large dog with its properties. It took several years until its breeding characteristics exactly matched the needs of the hunters.